Toss your tambourine to the moon in celebration! Make a joyful noise on the flute and the stringed instrument! 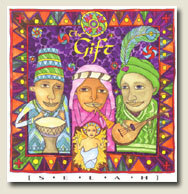 Allow this colorful blend of folk instruments and musical styles from around the world to draw you closer to The Gift this Christmas.